Life has come to a standstill, at least for the hour. In this forgotten place the tree and I wait on the shore of time, temporarily free from the force motion and process and the surge toward--what? Something called the future? I am free, I am compelled, to contemplate the world which underlies life, struggle, thought, ideas, the human labyrinth of hope and despair. THIS WEEK'S CHALK THEME: "The Audacity of Chalk"
TEA DRINKING COUPONS from our friends at MAD HAT TEA CO. Yum yum! last weeks BEST ILLUSTRATOR IN THE UNIVERSE winner: RR Anderson! by L.S.Erhardt on 7/24/2009 @ 12:12am They call it "Owl" color. Not sure why... seems more like a gray tabby than an owl. It says it's name is "Maylo" and he sleeps a LOT... which is a blessing since these old-skool ones don't have an off switch. AND and and! It comes with 4 each fresh AA batteries installed! by Erik on 7/24/2009 @ 12:17am Very cool prize Thorax! by KevinFreitas on 7/24/2009 @ 6:59am I'll be there! Can't wait to see everyone. Don't be fooled by these clouds either -- the sun can still burn us through them! by Dave_L on 7/24/2009 @ 8:29am By the time I got back from fetching water from Sanford and Son, Mandi had most of the old chalk washed off, though there are some ghosts that just won't wash off. Regardless, there are some fresh surfaces to enjoy, so come on down. The scene chalked by guy-with-ladder still looks so awesome it got a stay of execution for another week. by KevinFreitas on 7/24/2009 @ 8:58am Thx Mandi and Dave_L! I should be able to help wash next week. If nothing else, I'll put the key to Laura's on my ring so it can easily be handed off. Also, at the suggestion of Adam the Alien, this week's count should include any Twitter posts during the allotted time between 1pm and midnight tonight tagged #frostpark. I'm certainly willing to help with this this week but, if you use Twitter to vote, please make sure the word "vote" is in there as well. Use the word "vote" in your comment or tweet your vote with the #frostpark tag. by Mandiferous on 7/24/2009 @ 1:59pm Wow. So many awesome entries this week! I'm gonna have to vote for Ariel-- I like eyes and swirly things. by L.S.Erhardt on 7/24/2009 @ 2:13pm I vote the 5th. Oh wait... in this case I do want to testify. Ya hear me? TESTIFY! VOTE O'TOOL, BROTHA! TESTIFY! by Mark Monlux on 7/24/2009 @ 2:24pm I think we should all take note of the passing of a great cultural icon that brought joy to millions. I speak of course of Gidget, the Chihuahua who was a spokesperson, um, spokesdog for Taco Bell. You might remember Gidget's last roll as Bruiser's mom in "Legally Blonde, II". But, it's was the Gidget pushing Tacos and Chalupas that America and the world grew to know and love. Farewell, you fine little dog. A vote for Mark is a vote for the memory of Gidget. I vote for - sniff - sob - I vote for Gidget! by KevinFreitas on 7/24/2009 @ 2:27pm I love unknown 2's piece and think Jim just did a beautiful job. Nice work not putting stars behind the dark portion of that crescent Moon, Thorax! Great to have you back Ariel and congrats on the new little one. Mark, were it not the death of a very annoying dog you're commerating I might have voted for yours but, this week, I gotta vote for Stowe's piece. Yeah, it includes me but I'm truly excited to be working with the CLAW crew to bring their amazing work together on FeedTacoma. Stay tuned indeed. by Nick on 7/24/2009 @ 2:42pm I'll throw my vote in for Ariel - love the colors! by Zanna on 7/24/2009 @ 3:22pm I vote for Thorax - cause you need another furby to add to the family. by Wings_of_Change on 7/24/2009 @ 3:27pm Im gonna vote for my eye. it turned out amazing, and its the first work Ive done since Liam arrived. It was so nice seeing everyone again! cant wait for next week! by Libby on 7/24/2009 @ 3:39pm Tough week --- really great material. My vote goes to Jim J. Wasn't expecting to see that where it was drawn. by LipsMcGhee on 7/24/2009 @ 3:49pm I vote Mark Monlux. Very creative, and great techniques used! Mark, I hope you get that ugly Furby. by Emilie has one foot on shore on 7/24/2009 @ 3:58pm Nice work everyone! Congrats to ladder man for kicking off the expanded use of wall-space! I like KF's head full of ideas as imagined by Stowe and I do admire the soft, unexpected sweetness of Jim J's Blooms in that concrete park. Ariel's eye looks all-seeing.... but I have to go with RR's Bilge Pump Balm. 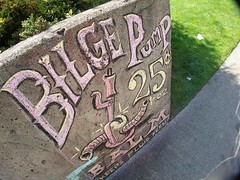 I'm a sucker for old-timey lettering. 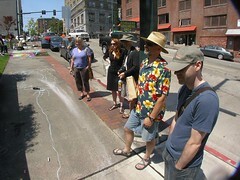 by Mark Monlux on 7/24/2009 @ 4:02pm I took photos of both the art and of people. 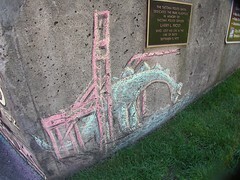 Since I wasn't there last week I can't tell if some of the found chalk work was old or new. Check it out and email me if you think I found something new. I will then post back here. by beerandhotdogs on 7/24/2009 @ 4:15pm Unknown #2. I always thought those looked like dinosaurs. by bluegodjanus on 7/24/2009 @ 5:34pm Darkain is a bit dumb today and havered off without posting the great pictures he took. They can be found here. Also, I vote for Ariel's eye. by NineInchNachos on 7/24/2009 @ 6:02pm Unknown #2 is 3D studio max master Scott Vigil from Artifex (co worker). His first Chalk entry! Done one handed holding a submarine sandwich! by Earthdaughter on 7/24/2009 @ 6:47pm Yes, indeed. Another hard decision. Love the eye, Ariel. And Brian's nod to a great employer AND chalk art. But I, also, loved the irises so I'm voting for Jim J.
by Tataddict on 7/24/2009 @ 7:35pm My Vote is for Brian This piece to awesome. and huge!! by Erik on 7/24/2009 @ 7:51pm Nice entries. Wish I could have been there. I vote for Brian. by Girl Who <3 JUNK on 7/24/2009 @ 7:52pm I vote for Ariel. Nice colors! Plus, my nickname in high school was "Bright Eyes". by NineInchNachos on 7/24/2009 @ 7:55pm as a guy who, when the occasion presents itself, walks around wearing a fez with an eyeball; I must vote for the mystical eyeball. I vote for Ariel. by traciekb on 7/24/2009 @ 8:23pm I vote for Brian, the ladder man. I love the chalker chalking the chalker chalking! Kudos to Thorax from a piano teacher. by Lucki13 on 7/24/2009 @ 8:37pm I am new to this form of art, but am finding it most inspiring. There are terific entries and a few really stuck out, but if I can only have one vote, I vote for Brian. I love pictures of drawing pictures! by NineInchNachos on 7/24/2009 @ 8:47pm Hey does able remodeling do kitchens? by tacosaladtuesday on 7/24/2009 @ 8:50pm My vote is......for......BRIAN. His art makes me smile! A runner's up for Mark. I love tacos. by NEAL on 7/24/2009 @ 10:15pm I vote for monlux. Poor puppy. by Erik on 7/24/2009 @ 10:42pm Intense voting for the Furby! by tacomachickadee on 7/24/2009 @ 11:00pm I vote for Ariel. by Courtney on 7/24/2009 @ 11:06pm I vote for Ariel's eye! It's beautiful and congrats on the new addition. by itsjim on 7/24/2009 @ 11:19pm I vote for Mark Monlux. Great technique! As a personal aside, and as a newcomer to Chalkdom, I have to say I don't think we should vote for ourselves; with so much talent presented every week, we should look for the best that other people have done, IMHO. by tapwater on 7/24/2009 @ 11:46pm The Simpsons. Did you read it with the jingle music? 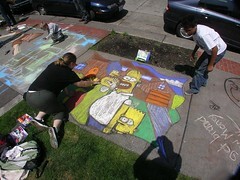 by tapwater on 7/24/2009 @ 11:47pm Love the Simpsons and love my son and his aunt working together to create art. Cool, very cool Caleb & Kimmie. by KevinFreitas on 7/24/2009 @ 11:54pm I am voting for Ariel's eye. It's and eyeful. Bah-Dum-Dum. by jamesstoweart on 7/24/2009 @ 11:56pm my bad, that was me on Kevin' account. Don't ask me how I hacked it. C.L.A.W. secrets. by jamesstoweart on 7/24/2009 @ 11:56pm for clarity sake... I am voting for Ariel's eye. by Adam the Alien on 7/25/2009 @ 9:58am *facepalm* I completely forgot to vote. Curse you, sleep! by Dave_L on 7/25/2009 @ 10:24am Yes, I was waiting to vote and fell asleep myself. Could possibly have had something to do woth that wonderfil Ninkasa IPA at the Rosewood. I was able to stop by yesterday anfternoon and check out the chalk for real. Great entries, and it's cool to see new participants joing the fun. For zombie fans, yesterday I did also see the greatest zombie painting done by ElWitt on dispay at the nearby What? Shoppe on Broadway, carriers of "Illustration" and other illustration/cartooning fare. The best, most detailed vintage horror-movie-type painting I've ever seen. Erik, the phone number you were using for me is no longer good - check your email. by KevinFreitas on 7/25/2009 @ 11:04am The tally is in! Congrats to Ariel and well done everyone. It was a wonderful week of chalking with some great pieces by so many newcomers. @Adam: Dude, I even said you could vote via Twitter starting this week! :) Just don't forget you can do so next using a #frostpark tag. by L.S.Erhardt on 7/25/2009 @ 3:07pm Ariel... make sure you come to the chalk party next Friday. I'll bring the Furby then. by Erik on 7/25/2009 @ 4:05pm Congrats Ariel! make sure you come to the chalk party next Friday. I'll bring the Furby then. by L.S.Erhardt on 7/25/2009 @ 5:08pm Eric, I assure you the Furby works. ...which is pretty impressive for a 10 year old toy robot.